The service was held on a boat near a heavy lift transport vessel that is holding the corroding, 6,800-ton Sewol. 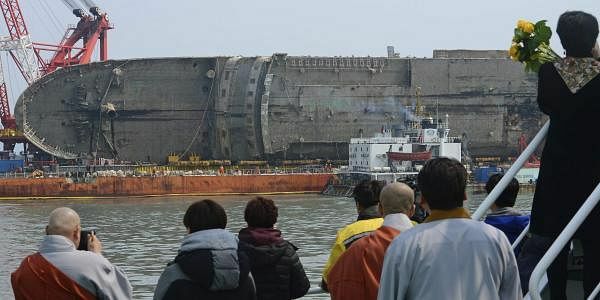 SEOUL: South Korea on Tuesday held a memorial ceremony for the nine passengers still missing from the 2014 ferry disaster that killed 304 passengers near the ship's wreckage that was raised last week. Relatives of the missing victims cried as representatives of Catholic and Protestant churches and Buddhists delivered prayers wishing for the remains of the nine to be recovered. Relatives threw into the sea yellow roses, a color that has become the symbol of their suffering, and watched from afar as crews on the transport vessel continued to empty the ferry of water and fuel. If the operations go as planned and weather conditions are favorable, the transport vessel will begin carrying the ferry to a port in Mokpo on Thursday, according to South Korea's Ministry of Oceans and Fisheries. The bodies of 295 passengers — most of them students on a high school trip — were recovered after the sinking, which triggered an outpouring of national grief and soul-searching over long-ignored public safety and regulatory failures. Popular outrage over what was seen as a botched rescue job by the government contributed to the recent ouster of Park Geun-hye as president. Relatives of the missing hope their remains will be found inside the ferry. "The ship has come up, but not the nine people inside it," Lee Geum-hee, the mother of a missing school girl, told a television crew. "Please don't forget there are people inside the dirty, rusty and smelly wreckage ... Please do the best and let us bring them back home"
Once the ferry reaches Mokpo, investigators will spend about a month cleaning the ship and evaluating it for safety. They will then begin to search for the remains of the victims and look for clues that could further illuminate the cause of the sinking, which has been blamed on overloaded cargo, improper storage and other negligence.